On the way home yesterday, people were calling in to the local radio station, asking about all the smoke in the air. Initial reports were that it was a controlled burn, but later on people reported fire engines and water-carrying helicopters. This was the view from our porch last night. 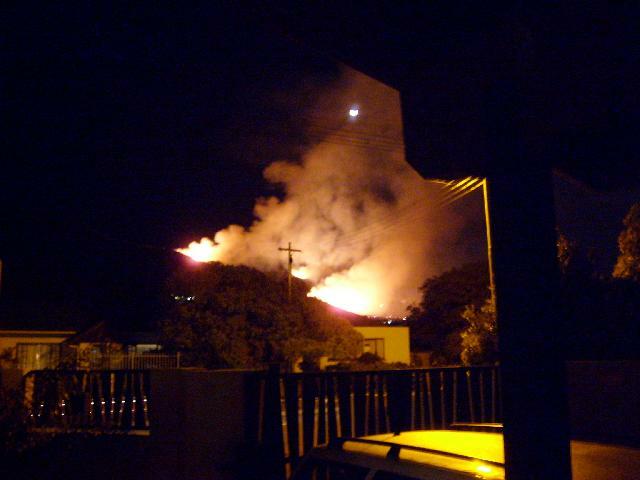 The fire came over the mountain and down to the firebreak, probably no more than 50m from the top row of houses. Fortunately there was absolutely no wind (well, just a breeze, carrying the smoke to the right as you can see). Here’s a Google Earth image of the area. We live over there, on the right, between the red roofs at the top and the circle on the right edge. The camera’s pointing just a touch south of west. The white line is where I guess the fireline was. If your wife says “I have the hiccups,Â quick, someone, give me a fright”… DON’T. Because she will spill red wine all over the couch, the cats, you, and herself, thereby upsetting the cats and ruining the couch and her clothes, and it will all be your fault. At least it cured the hiccups. … in the De Waal / Hubbard / Blake household when you walk in the door and this is what you see. This is a recipe from Jamie, which I scribbled down from a book my mom had. Simple, but great, especially if you have a vegetarian daughter who lurves mushrooms. Thinly slice a punnet of brown mushrooms, fry in oil, add salt, pepper, maybe a bit of marjoram or rosemary, maybe a bit of chilli powder. Add one cup vegetable stock, bring to boil. Meanwhile, boil a pot of water with a lot of salt, then slowly (as to not douse the boil) add gnocchi. When they float, remove with slotty spoon, add to mushroom sauce. And that’s it. OK, you can add a couple of tablespoons of Creme Fraiche if you’re feeling decadent. Looks like I have something to read this weekend. LabRat pointed me at fukung.net. This is a horrible waste of time. And not safe for work, which means it’s your own time you’re wasting.